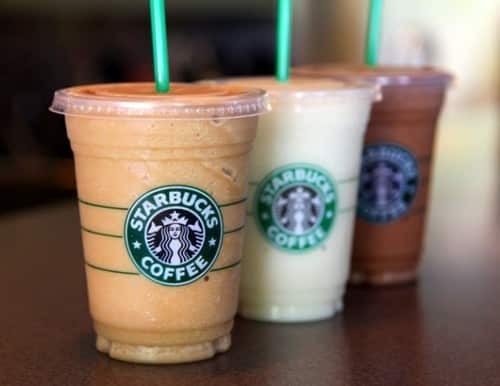 In about as much time as it takes to stand in line at Starbucks and order one of their Grande Light Frappuccinos, you can make one yourself at home and save about $4.00. Just try this Frozen Blended Cappuccino Recipe and enjoy the creamy, coffee flavored goodness that you know and love. Each DIY Frappuccino is low in fat and calories and tastes fantastic. I found that the French Vanilla flavored creamer was sweet enough for me, but feel free to add a bit of Stevia if you want it really sweet. Quick and easy to make, it’s a fantastic low calorie frozen blended coffee drink recipe for any Weight Watcher. And best of all – no fancy espresso machine or name misspelling barista required. Enjoy! Enjoy a homemade version of Starbucks Light Frappuccino from the convenience of your own kitchen. This low calorie frozen blended cappuccino, makes an ideal frozen coffee fix for Weight Watchers Members. Blend all ingredients together in a blender and process until smooth. If desired, sweeten with Stevia. Use Stevia. Splenda is poisonous. Stevia isn’t exactly safe. I read it can cause genetic mutations from several reliable sources. I’d use splenda before I ever used Stevia. Though I’d say sugar in moderation is the safest of all. Stoves is a plant. What are your sources? I’m 68 years old and have been using artificial sweeteners for as long as I can remember. We used the little tablets in our iced tea when I was a kid. I don’t have two heads, any extra appendages or missing parts. Anything we use should be used in moderation whether it is natural or man made. Oh, I have not had any form of cancer and none of my family for the past five generations have had cancer but we have had had weight issues. Great recipe. I love frapps. As an overworked and underpaid misspelling barista, I am glad there is a recipe at home. ;) I added it to my recipe pinterest board. I used a liquid flavored creamer I had in my fridge and then doubled the coffee I put in. This seemed to give it more of an actual coffee taste than milk taste. I just made this using unsweetened almond milk and 1 truvia packet and it was sooooo delicious. I should have added more crushed ice for a more thick frap but better than paying $5 at my local starbucks and it tasted so delicious! Making again real soon! Splenda? Are you kidding me? Are there still people eating that toxic chemical cocktail? And they haven’t grown an extra ear yet? Please, if you’re going to make these drinks, don’t crap them up with artificial stuff that can kill you. Sugar should be used in moderation as it’s processed. I prefer Stevia-it is natural. Sorry, sugar is not good for you unless it’s natural, like in fruit or agave nectar. I prefer Stevia, a natural sweetener. People are still buying in to the internet garbage that Splenda is bad for you? Yes it is technically a chemical…so is sugar, they are both made up of carbon, hydrogen and oxygen. both chemical compounds. And research has shown NO bad effects on people who consume splenda in even its highest amounts. The real problem is, is that someone reads something online, it spreads and soon everyone is saying it, and we have a mass of people who can’t think for themselves. You’ve GOT to be kidding me. There are TONS of studies that link Splenda and other artificial sweeteners with all sorts of diseases. You must be reading a different internet than I am…or than a dozen MD’s who know a thing or two about nutrition and disease are. I just want to share that there are actual links of people being scared of dihydrogen oxide. Wanna know why? Because it sounds scary. Just so we are aware that is water. Pretty sure its not going to kill you. Instead of arguing on the internet let people do what they want. If you dont like it fine then just dont eat it. I just tried my own version. I put vanilla almond milk in ice cube trays and froze them. I filled up my single cup blender with the ice and added instant coffee and a bit more of the almond milk to fill in with some liquid. Worked out perfect! I never go to starbuck because of the price of these things. This was way cheaper version. I am going to try it your way next though. I agree; I use almond milk all the time. Just made this but I used whole milk because that’s all I had. I also added a little extra coffee creamer to add some sweetness. It was delicious! Thanks for the recipe. I’ve added a post to my blog about it and linked to you. Thanks again! Skip the Splenda…..Splenda is a carcinogen….it is safer to use plain sugar. I have tried to make my own frapp from home once – it did not turn out too well but i am determined to try again. I currently go to starbucks every single morning, sometimes twice a day so it will be nice to master this recipe and drink this instead. I typically drink the mocha peppermint frapps with soy milk – so i have sugar free peppermint syrup on hand at home – once i get a blender that is strong enough for the ice cubes, i think i will be good to go! Made this as soon as I saw the post…YUMMY! instead of using the powdered creamer I used Hershey chocolate caramel liquid creamer and did not have to use any sweetener at all! I made this as soon as I saw it YUMMY! But instead of using powdered creamer I used Hershey chocolate caramel liquid creamer and fiddling not have to add any extra sweetener at all! Everything is a cancer causer anymore, so it doesn’t really matter what you put in your body if your cancer cells is going to react it will react to whatever it needs to when you put it in your mouth. It’s different for everyone considering their already in your system they just aren’t active. What an inane remark. *Everything* doesn’t cause cancer, but there are many, many studies showing that Splenda does. What about a Vanilla Bean frappichino? I wont go to starbucks anymore after something they said before. But i love their Vanilla Bean i need a alternative to make myself ??? I would challenge you to find a study that linked it to cancer in humans. I read an article on Huffington Post recently that said while there were studies that showed the cancer in rats, there wasn’t any evidence of this happening in humans. I personally don’t care for either, but good science means results are replicated. This is halfway science. Humans are not rats. I love you! I am SO missing Starbucks on weightwatchers! if you freeze coffee into ice cubes and exchange that with the ice cubes, you won’t have to worry about watering down your drink! How do you make the vanilla one? You had me until powdered coffee creamer. It’s all processed chemicals. The best artificial sweetener to use that’s all natural and tastes great is nustevia! it does not have the poisons that the rest has in it. its just milk, with the desired flavor syrup instead. Can I use pre-made coffee like from my kureg for this?? I don’t have coffee granuals?? Coffee granules are basically just instant coffee. So you want to make sure to use that…not pre-made coffee. As one of those underpaid overworked misspelling baristas, we use cold pressed coffee for our frapps. Of course you can use already brewed coffee. And no I don’t work at Starbucks. This is soooo good I did cut back to one Tbsp of coffee,but the closest I have found to Starbucks Cafe Vanilla. I had smaller ice cubes so I measured them out and 1 cup of ice is perfect. Thanks so much for sharing. Very good I used sugar free Davinci gourmet caramel syrup you can get it at A Sam club 24.4oz bottle for $5.00. They also have other flavors and some that are not sugar free too. I bought the ingredients specifically for this recipe since I don’t generally keep instant coffee or powdered creamer in the house. Whoa! The coffee was waaay too strong! I added about 2 tablespoons of liquid creamer and some more ice cubes, which definitely helped. Since I have the ingredients on hand anyway, I will make it again with the following changes: I’ll start with 1 tablespoon of coffee (I can always add more if needed), keep the 2 tbsp. powdered creamer, and add a packet of splenda. My advice is to use less coffee on your first attempt. Can you use liquid creamer or does it have to be powder? Why not just make cold brew coffee and keep it in the fridge. Then add the ice, sweetener, and milk and blend when you want a frapp? That way you don’t have to use the instant coffee garbage. Anyone can make cold brew coffee, it’s embarrassingly simple and keeps well in the fridge for several days (if it lasts that long). You’re so right, Becky. Actually, it lasts longer than several days. And, if you freeze it into ice cubes and use that instead of *real* ice cubes, your drink won’t get watered down. If you add a pinch (~1/8 tsp) of xanthan gum, the final product has a slightly better texture (more like the real thing). where can i find the Xantham gum? Any health food store, or online. If I don’t have powdered creamer, can I use the normal liquid kind? Delicious…I used almond milk which has fewer calories and carbs…fantastic!!! Where have you been all my life! Thank you. Also found the 2 tbsp of coffee a bit strong but it was still super yummy! What a yummy treat….I made it as soon as I saw it on Pinterest! And, am enjoying it at the moment. I added 2Tbsp white sugar -not a fan of artificial sweeteners or substitutes. This is my new BEST indulgence.. I also used decaf. Instant coffee to avoid a sleepless night ;). Thanks soooo much for sharing this simply wonderful recipe! love this!! I saw it on pinterest and knew i had to try it! i used hazelnut creamer and it was sooo amazing <3<3<3 thanks! These look GREAT!! Thanks for the posting! Next time I will try 1 Tbsp of coffee instead of 2,it was a little to strong for me. omg this is so good! I used starbucks instant via coffee and i only used one packet. If i would have done 2 tbl it would have been really strong. I did everything else the same and used two packets of splenda. Stevia is a natural sweetener that comes from a herb. Besides everyone knows that artificial sweeteners only trick your brain to think you’re eating something sweet. (not from what I’ve heard on TV). It is in the processing and development of Splenda that causes it to become a carcinogen……I have held a Doctorate in natural health for 15 years and would never take Splenda, sucrolose, or any artificial sweetner. Do you use Stevia? I’m asking because I don’t know what to use. I was using just agave, but I’ve heard it’s not great either. Personally, my family uses Stevia over Splenda because Stevia is natural and Splenda is artificial. On the other hand, Stevia is extracted from leaves using ethanol, and such a chemical process can lead to debate about Stevia being “natural”. Splenda, by the way, has also created a “natural” version of their product. I personally recommend using honey (unless you are allergic to bees/pollen). Honey is great from your health, and it is truly natural. Pure maple syrup is also an alternative. Is that even a real degree? From what university/graduate school? I’ve been in healthcare for 22 years and I recommend both Splenda or Stevia in moderation. Red M&Ms also cause cancer…oh, wait, nevermind, that was bogus too. A latecomer to the “party,” :) but I noticed that when I used Splenda in my tea every day, I had stomach/bowel issues. Not everyone has this problem, but several folks I know personally do. Sooo, I need to avoid Splenda. Just my two cents. How do you get the coffee to be smooth? The instant coffee granules will dissolve in the liquid. Make sure to use INSTANT coffee…not regular :). Thank you for this wonderful recipe!! I ran this through the WW recipe builder and it came up with 3 points plus for me. Has anyone else had the same result? You have saved me from jumping off my diet train today. This was SO good and I actually like it much better than the ones from Starbucks. Thank You!! Thank you so much! I’ve only made this once, but can tell that I’m already addicted! lol! Thank you so much for this recipe–it is awesome!! I have been looking for years for a DIY light frappe recipe. I used instant espresso powder, as that is what I had on hand. love these! I use the maxwell house international flavors instant coffee, the mocha and hazelnut are my favorites. I only need one tbs of the flavor and I add 1/2 tbs of the coffeemate sugar free vanilla creamer. It adds some calories but still not like if you bought it at Starbucks. Thanks for sharing. Tried this today and it was GREAT! Instead of using regular ice cubes, I used coffee ice cubes and a little more creamer. With your permission I would like to feature this on my website with a picture and of course a link back to your site. It would post 02/27/12. Thanks for sharing this! Can you just use prepared coffee and maybe less milk? Because I don’t use instant coffee! I buy Starbucks K cups for my Keurig! YUM! Yes, absolutely. Though more water and less milk will make it a bit less creamy. I just saw something about making coffee ice cubes with your left over coffee. I would think you could just use these instead of the instant coffee & ice cubes. What do you add to make the caramel one? Just a different powdered creamer? I believe you can find caramel or Dulce de Leche flavored coffee creamer at the grocery store, which you could use instead. But how do you make the Mocha one? Just add some cocoa powder. This refers to the actual dry instant coffee powder or grinds, vs. instant coffee that has been prepared. I just tried this recipe (found you on Pinterest too) & it’s delicious! So easy to make and much cheaper than Starbucks. Thanks for posting this! Just made this with liquid creamer and espresso powder. I am amazed at how well it turned out. A little too strong of a coffee flavor for me, so next time it will be half espresso, half coffee. Thanks so much for the recipe! I love to make this too, sometimes I add a Tbs of sugar free chocolate syrup…so yummy! Thanks soooooooooo much for sharing this! I can't wait to make this. We are on day 54 of 100+ and this is going to be perfect! Is that just supposed to be 2 tbsp of the creamer? Yes! Sorry…that was a typo..thanks for catching that!! It's been corrected.